Estonia is a former Soviet republic which has regained its independence in 1991. It’s population of 1,340,000 is smaller than that of Hamburg. Estonia has cultural links to its Northern neighbor Finland, which lies across the Baltic Sea. Estonia has now adopted the euro. Price stability. The Treaty stipulates: “The achievement of a high degree of price stability … will be apparent from a rate of inflation which is close to that of, at most, the three best-performing Member States in terms of price stability.” In practice, the inflation rate of a given Member State must not exceed by more than 1½ percentage points that of the three best-performing Member States in terms of price stability during the year preceding the examination of the situation in that Member State. So, it seems like the best-performing country with respect to price stability was Ireland, because it experienced deflation, as you can see in the graph above. 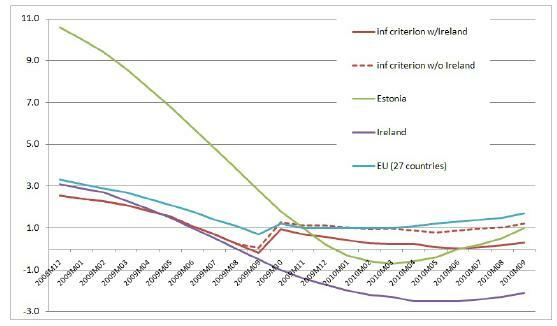 If you include Ireland then in the category of the three best-performing Member States in terms of price stability, then you will notice that in March Estonia’s inflation rate was somewhere around -.75% while that of the three benchmark euro area members including Ireland was around 0.25% and excluding Ireland around 1%. Ooops. The economic convergence criteria ensure that the applicant countries have established economic conditions that are conducive to the maintenance of price stability and the coherence of the euro area. The framework of analysis comprises developments in prices, fiscal balances and debt ratios, exchange rates and long-term interest rates, together with other factors. A number of general rules are used in the application of these criteria. The individual criteria are interpreted and applied in a strict manner. The criteria constitute a coherent and integrated approach. They must all be satisfied. The Treaty lists the criteria on an equal footing and does not suggest a hierarchy. The criteria must be met on the basis of actual data. The application of the criteria should be consistent, transparent and simple. Convergence must be achieved on a sustainable basis and not at a given point in time only. Well, so much for that. Once more, euro area rules are broken when push comes to shove. The stability and growth pact set the precedent, and now the euro convergence criteria follow. It seems that economics is not taken seriously at Europe. Which must not be a bad thing, but let me note it anyway. There is a lot of work on optimum currency areas, and I believe that countries with too much foreign debt would be better off without the euro than with it, as it stands. It is generally recognised that a monetary union requires sustainable macro-economic convergence among the participating countries. Once a country joins a monetary union, it loses the possibility to use the nominal exchange rate as an instrument to correct a loss in competitiveness. As monetary policy decisions in the EMU are taken in the light of the economic conditions prevailing in the entire area, economic convergence is required to ensure that a country’s economy is sufficiently prepared for the monetary union. « Mervyn King: radical or good economist?